Resolution products are extensively documented, with help readily available for all functions. In most cases, the help includes an explanation of the theory behind the pricing approach, as well as more specify information about how to enter the function in Excel. If you need general information or you're not sure where to look for something specific, the Resolution help file is available from the Resolution menu within Excel. 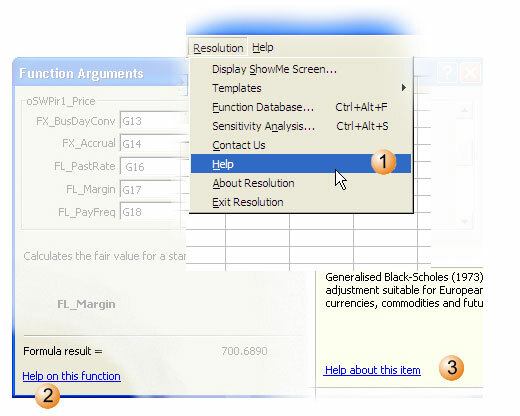 When using Excel's Function Wizard to insert or edit a function, help is available for all Resolution functions by clicking on the 'Help on this function" link. In the Resolution Function Database, along with a short description of the purpose of each function, you will find a link that will open the help file for that function.